LIZ: First off, when I say South Pacific, I am referring to the 1958 movie, not the 2001 TV movie or the play, neither of which I’ve seen. Now that I’ve made that disclaimer, on to the movie. I love the music (how could you not like a Rogers and Hammerstein collaboration?). “I’m going to wash that man right out of my hair” and “I’m in Love with a Wonderful Guy” are a lot of fun and have catchy tunes. I must admit to having sung the former with a good bit of feeling at times. “Some Enchanted Evening” is, of course, a romantic favorite. I like the cast too. Bright, cheerful Mitzi Gaynor is perfect for the nurse in love. The sailors are a great comic relief, about a 101 pounds of fun worth actually. Pretty much the only thing I didn’t like about the movie was the storyline … It just felt preachy. The lieutenant lost my sympathy leading Liat on when he had a girl back in the States, and I just didn’t see why Nellie had such a problem with Emile having had a Polynesian wife. Side note: The play actually won the Pulitzer Prize in Drama in 1950. I know Carousel, Singing in the Rain, and The Sound of Music are just a few of the musicals that aren’t all laughs and giggles, but I still have a hard time putting musical and drama together in a movie description. LIZ GOES INTO SHOCK: I did a little snooping on IMDB and discovered that most the voices in the movie were dubbed! The lip-syncing was excellent, but WHY? The scene where Emile sings (you think anyway) “Some Enchanted Evening” to Nellie loses something knowing that it’s faked. Don’t get me wrong, I like the actors, but surely there were enough singer/actors to cast people who could actually perform the role in its entirety. Mitzi Gaynor actually does her own singing, by the way. Conclusion: It’s not my favorite Rogers and Hammerstein musical, but it has great music. JAZ: Nellie Forbush is terribly, passionately, ditzily, hopelessly in love with Emile De Becque. But something’s keeping her from marrying the handsome, millionaire, golden-voiced, charming French-accented man of her dreams. Handsome, millionaire, golden-voiced, charming French-accented De Becque (The one on the left). Not crazy about the pleated khaki pants, though. Is it that they’ve known each other a mere two weeks? Or that he’s twenty-ish years older? Or that he killed a man in France? Or that he has two “mixed” children, which would bother most women in the WWII era? No, it’s the fact that his long dead and gone wife was Polynesian (“I lived as I could,” he explains apologetically). In other racist news, Lt. Cable can’t seem to wrap his mind around marrying Liat, the beautiful Vietnamese woman he loves. Basically South Pacific revolves around their getting over their prejudices. But for a film all about intercultural tolerance, there’s amazingly little of it going on. Apparently De Becque’s true name is “Frenchman,” because that’s what he gets called 99% of the time. Forbush condescendingly asks the children several times if they understand her, despite the fact that they’re trilingual and she knows only one measly language. And (SPOILER ALERT!!!!) only the suitably lighter-skinned couple ends up together. Cable dies tragically in battle, thus dooming the one possible interethnic marriage. What does that say about the film’s true stance on racial prejudice? Oh, and what’s up with all the color filters? Beaver liked the grass skirts. He said they made him hungry. We give this film 3 carrot sticks out of five. For the awesome song and dance numbers. 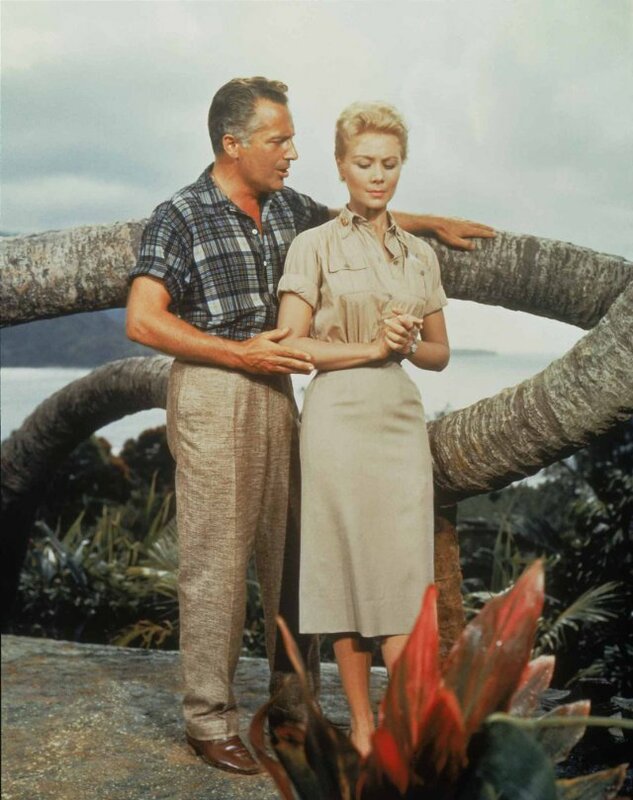 This entry was posted in Entertainment, Films, Literature, Music and tagged 1949, Bali Ha'i, interracial, Mitzi Gaynor, Musical, musicals, Polynesian, racism, Rossano Brazzi, South Pacific, Tonkinese, Vietnamese by Jasmín. Bookmark the permalink. Hi! I watched South Pacific once…. Had to fast forward a few songs. Some were incredibly boring I was more amazed at the acting. Takes great acting to act interested when someone is singing a song to you for about 10mins straight…and repeating a lot of the same words. That said, “Some Enchanted Evening” is a lovely song. 🙂 Thanks girls! Thanks an interesting take on it. Lt Cable was never one of my favorite characters.